I am so excited to be giving away my favorite crafting tool today. A Silhouette! I made this GIANT Vinyl Chalkboard Calendar wall with my Silhouette Portrait. And I will be sharing the full tutorial on Monday. In the meantime, here’s how YOU can win a Silhouette Portrait of your own!! Plus, Silhouette has some special deals for TTAJ readers just this week! Use this special link: www.silhouetteamerica.com/march along with the code to get the discounts! If you don’t have the Silhouette Studio Designer Edition software yet, this is a great price — it’s half off! If you don’t have the Silhouette Studio software, you will LOVE it!! There are so many things included with the software that you will love. Like a ruler that makes creating projects so much easier. 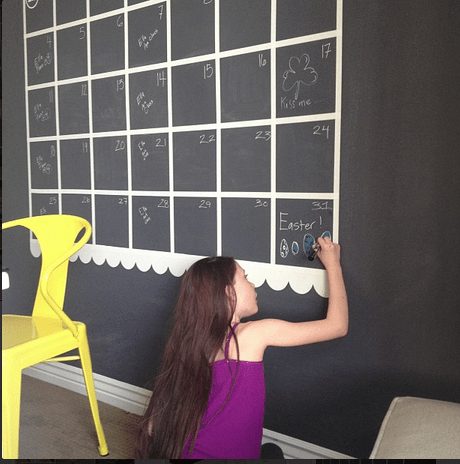 I will be sharing FREE .SVG files for the GIANT Chalkboard Calendar on Monday. for just $179.99, $70 off the regular price of $249.98! But you must use this special link and the discount code “TATER” at checkout! Now, here’s how you can win your very own Silhouette Portrait! 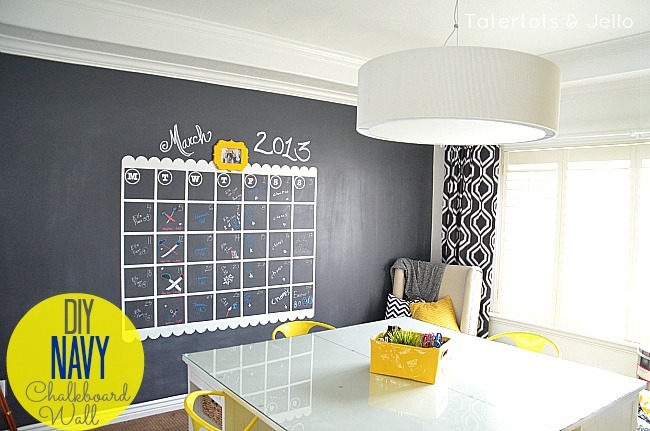 I can’t wait to show you how we made this GIANT vinyl chalkboard calendar wall. Ella has been having SO much fun embellishing it!! I am SO excited to see YOUR ideas. The Weekend Wrap Up starts soon. 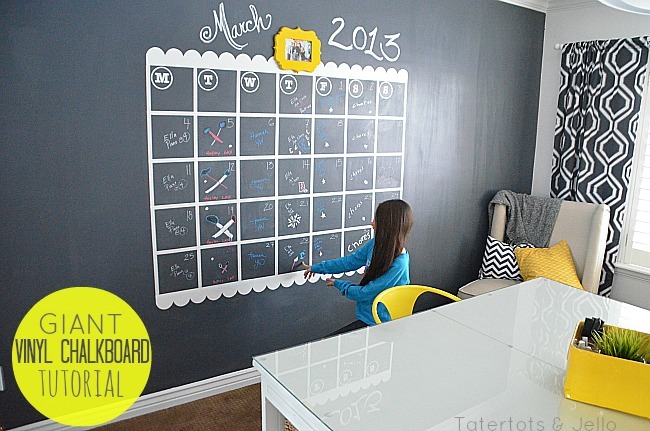 Turn a Mirror into a Chalkboard Organizing Station! Would LOVE one, but my husband won’t let me spend that kinda dough :/ hopefully I win!!! thanks for the chance to win such an awesome gift! That wall is awesome! I would love to do that in my classroom!! I REALLY want one of these! Thanks for the opportunity! Love, this!!! Fabulous idea an awesome give away, keeping my fingers crossed! Looks Amazing! Nice job. I love that your girls are getting into it too! such a fun idea…i’ve alwayys wanted a wall i could write on! I would love to win this! I have an empty chalkboard wall just waiting for it! I have been thinking about purchasing a Silhouette so this would be even better! I am a Cricut girl, and have been hearing a lot about Silhouette for the last several years. I would love to win! Thanks for the opportunity Jen. you are amazing!!! i don’t know where you find the time! this is marvelous! I love yer blog and all the great ideas you share with us non-creative types who need help from more talented folks! Thanks for the great giveaway…hope I win! Amazing, I am in love with your chalkboard wall. I need more wall space so I can do this! oh my,oh my!! How we would LOVE to win this whole “kit & Kaboodle!” I followed, shared and did all to win…Please pick me!! My kids would love this! Shared via FB. I entered to win!!! It looks like so much fun.. I would love to win this! Spring creations, here I come! I keep hearing about the silhouette machine! I’m excited to see who wins! what an awesome giveaway!!!!!!!!!!!!! thanks so much! Love your blog! Just started following. Thanks for the chance to win…. I’m am just dying to win one of these machines… I have so many ideas whirling around in my head but that calendar wall……Is soooooo AWESOME!!! Love this! Just bought some vinyl, would love the silhouette to help me create beautiful things like your calendar. I love the giant calendar on the navy wall….NAVY rocks! the grandkids are home schooled and this would be so cool for them. Oh I hope the random number gods are kind to me…I have lusted after these for some time! Cool wall! Would so love to win the Silhouette! Thanks for the chance to win. That looks amazing! What a cool wall! I would love to win the Silhoutte, I have been wanting one for a long time. Thank you for the chance and I will keep my fingers crossed one more time. Love the chalkboard wall and thanks for the chance to win the Silhouette Portrait. So love my Cameo. I´m so excited! I hope I win, Monday it´s my birthday!!! This is sooo awesome this giveaway. Been wanting a silhouette for a long time. Keeping my fingers crossed! I will keep my fingers crossed for you too Tina! !